I couple of weeks before Ernest was born, I made a zippered vinyl pouch to store my knitting in. It turned out to be so simple and useful, and I vowed to make you all a tutorial at some point in the future. The future takes 8 months to arrive apparently, because here it is! 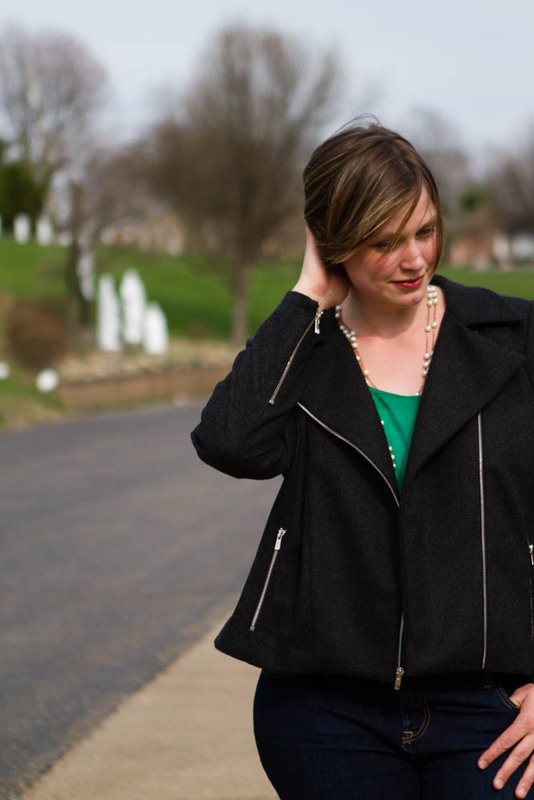 I really love this design because it calls for a minimal materials (vinyl, zipper, and bias binding), minimal measuring and cutting, and, with the way the zippers and binding are attached, you won’t need a specialty foot for working with the vinyl. I think an experienced sewist can sew this in less than 10 minutes, and a beginner in less than an hour. 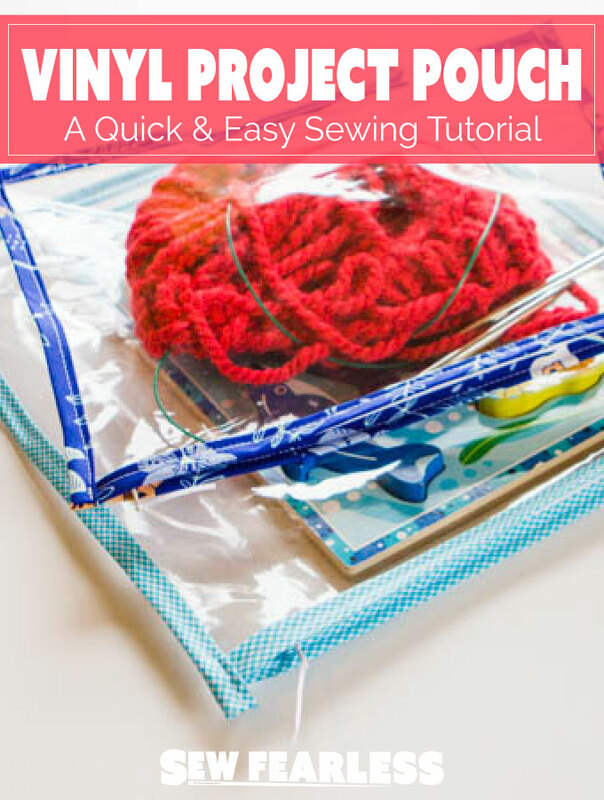 The only “tricky” part is keeping your topstitching straight on the binding. Just take it slow and you will be fine. 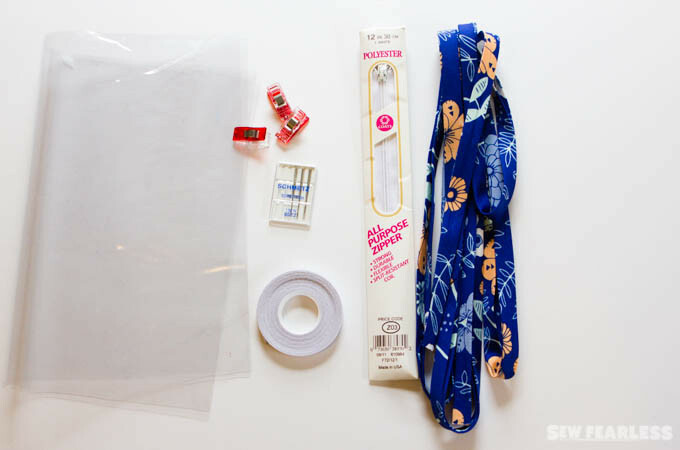 If you are new to sewing with vinyl, here are some tips to get you started. Vinyl is available in various thicknesses, and can be found with the home decorating or utility fabrics at big box fabric stores. 8 gauge vinyl is my favorite. Don’t use pins on the vinyl, instead use wonder tape (a double-sided sewable adhesive) and clips to hold the pieces in place. I use a size 90/12 topstitching needle for sewing vinyl, but a standard size 12 can work if that is all you have available. 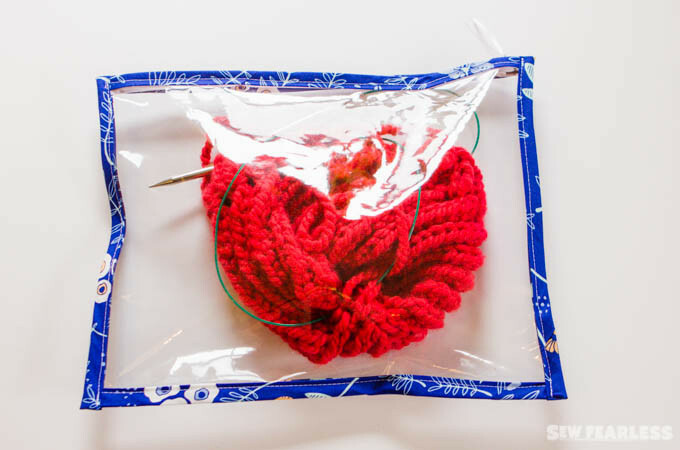 Use a slightly longer stitch length, because if the stitches are too short, the vinyl may tear. I like ‘3.5’. Because all the seams sewn are wrapped in bias binding, I find that I do NOT need to use a specialty foot to sew the vinyl. If you find that your vinyl is sticking against the bed of your machine, try covering your machine bed with post-its. The vinyl slides over paper better than it does plastic. Step 1: Assemble project materials. Step 2: Apply wonder tape to back of zipper. 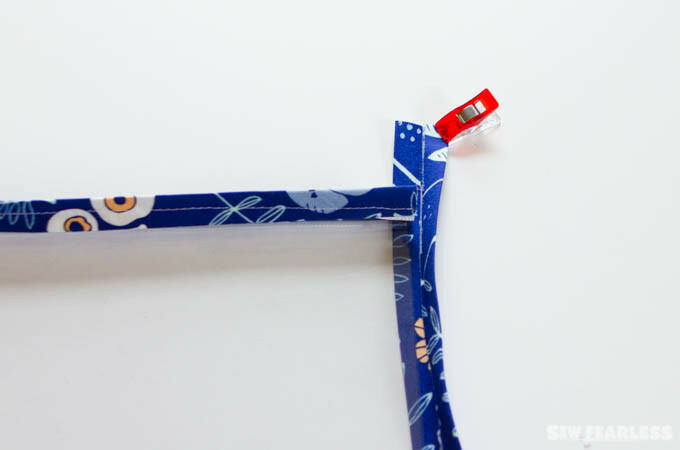 Apply wonder tape to zipper along each long edge on the back side of the zipper. Leave the paper backing on the wonder tape until instructed to remove. Step 3: Attach zipper to top edge of first piece of vinyl. 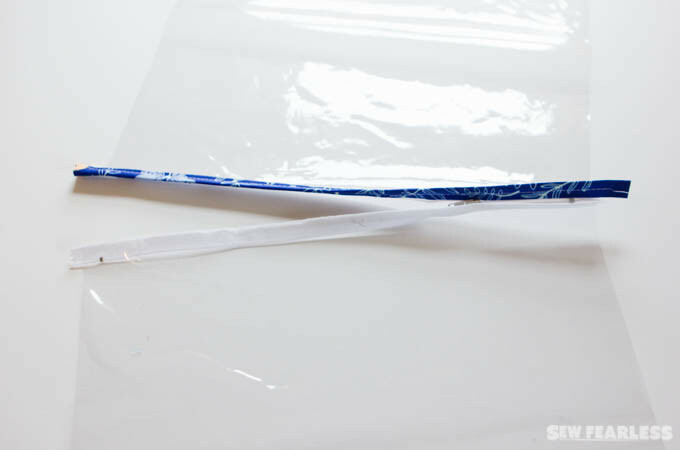 Remove the wonder tape’s paper backing on one side of the zipper. 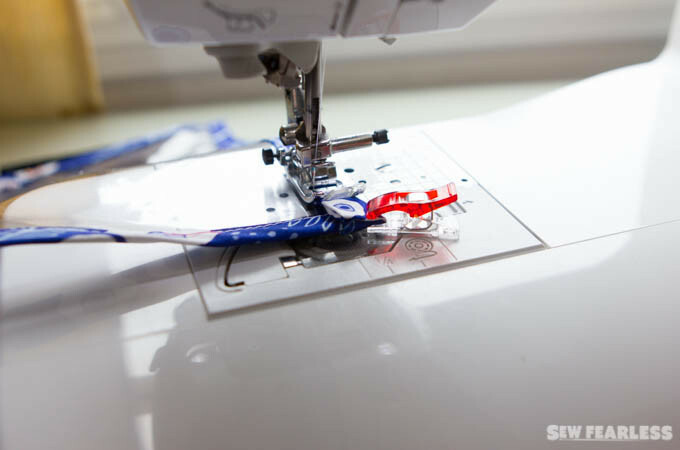 Lay the zipper face up on one of the vinyl pieces, with the long edges aligned, and the zipper centered. 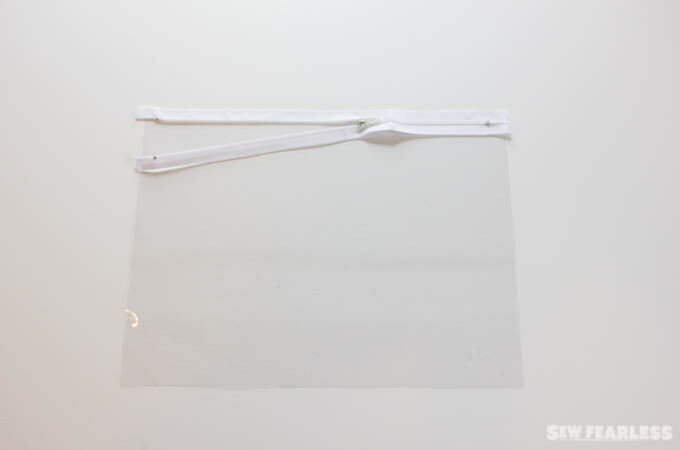 The zipper stops should be about 1/2 inch in from each end of the vinyl, and a small amount of the zipper tape ends will be hanging off the ends of the vinyl. The wonder tape will hold the zipper in place once positioned. Put the zipper/vinyl edge inside of the bias tape, with the bias tape overhanging the ends of the vinyl by about 1/2 inch. 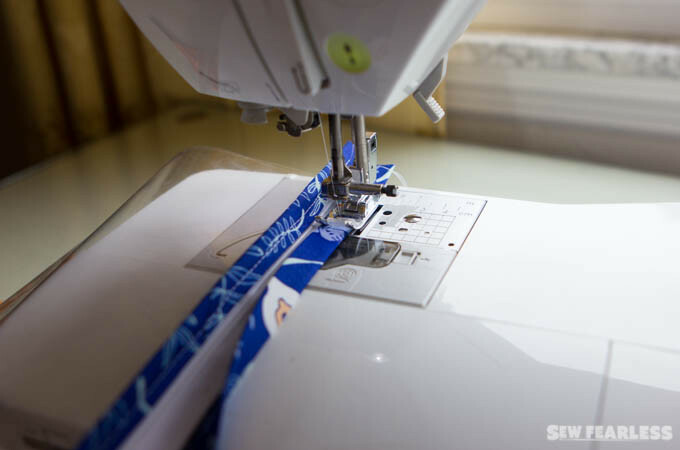 Sew bias tape to the zipper and vinyl along the inner folded edge. 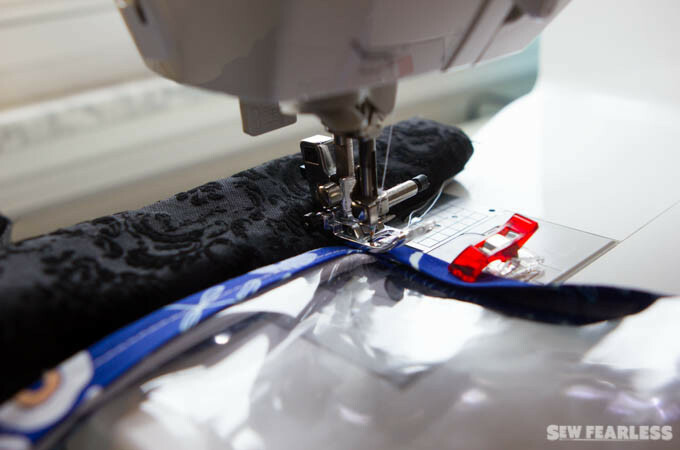 Tip: The trick to sewing zippers is knowing how to get past the zipper head when sewing the zipper on. 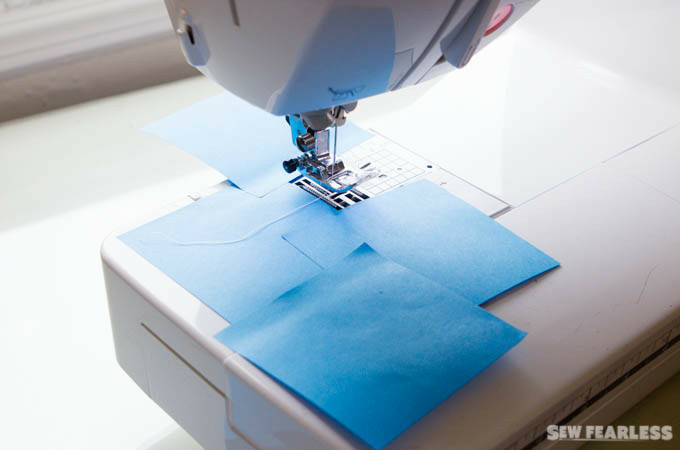 To do this, open up the zipper halfway while sewing the binding on. 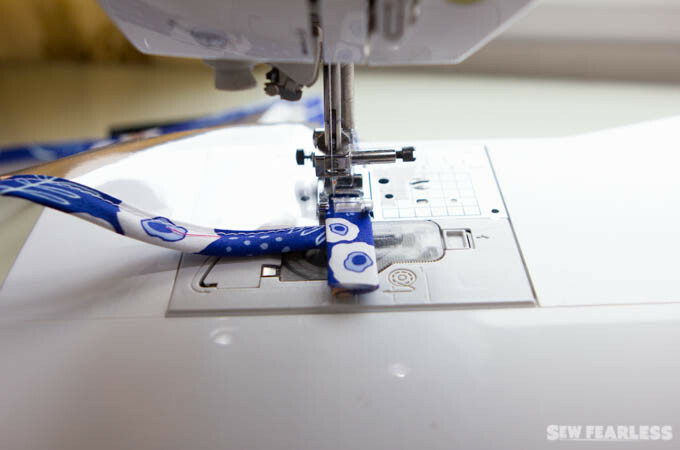 Stop sewing before reaching the zipper head, leave the needle down, and lift the presser foot. Slide the zipper head behind the presser foot, drop the presser foot down, and then continue. Step 4: Attach zipper to top edge of second piece of vinyl. Pull the zipper away from the vinyl piece it is already sewn to, folding the vinyl along the bound edge to get it out of the way . 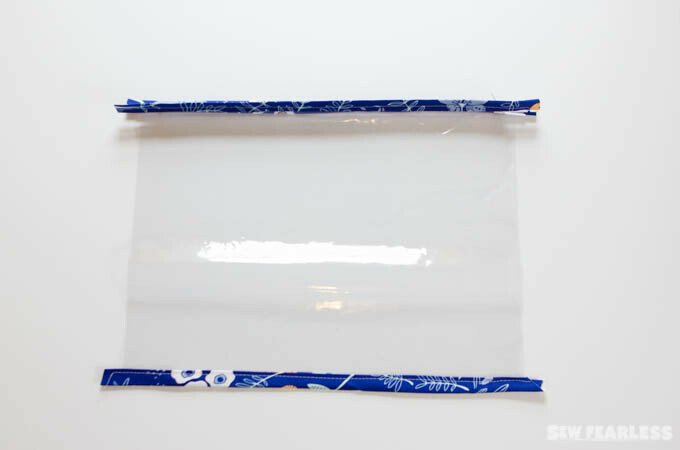 Peel the remaining paper backing off of the wonder tape on the other half of the zipper that hasn’t been sewn yet, and lay the zipper along the top edge of the second piece of vinyl just like you did on the first piece of vinyl. Sew binding along the second half of the zipper as before. Now that the zipper is sewn to the two pieces of vinyl, it will look like this. Step 5: Sew bottom edge of vinyl pouch. Now, we sew the bottom edges of the vinyl together. 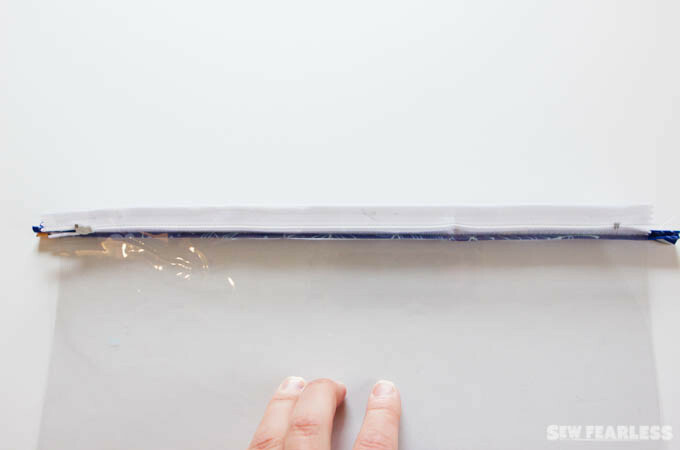 Line up the bottom edges of the two pieces of vinyl, use a small amount of wonder tape between them to hold them in place. Then, sew a piece of binding around the bottom edges. Step 6: Sew sides of vinyl pouch. 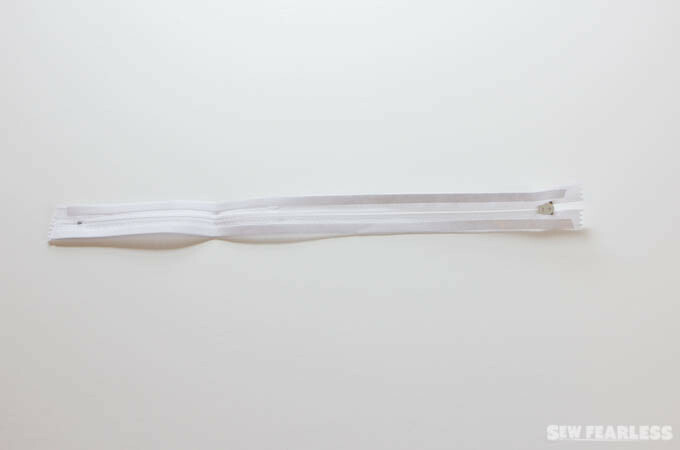 Trim off the excess binding from the right edge, and move the zipper head to the center of the zipper to get it out of the way. Then, place the right edge of the vinyl pouch inside of the binding lined up against the center fold, with about a 1/2 inch of bias extending past the top of the pouch. Fold the bias binding down over the top edge. Then, refold the bias binding around the right edge of the pouch. 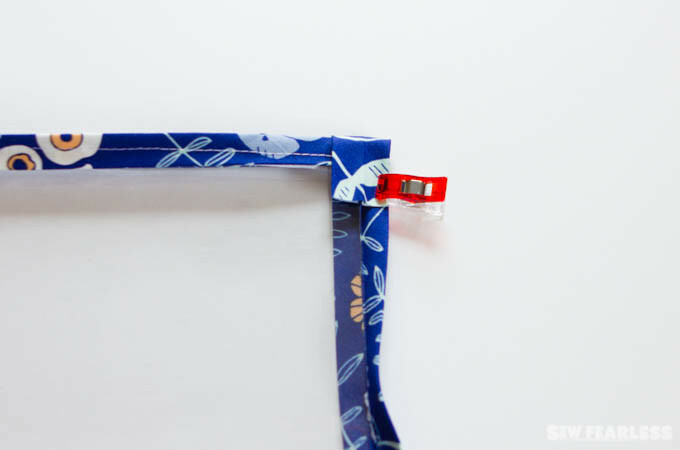 Use clips to hold the folded binding in place. Sew the binding to the pouch, backstitching at the start. It will be quite bulky at the top edge, and you might find it helpful to place some folded scrap fabric under the back of the presser foot to keep it level as you start. 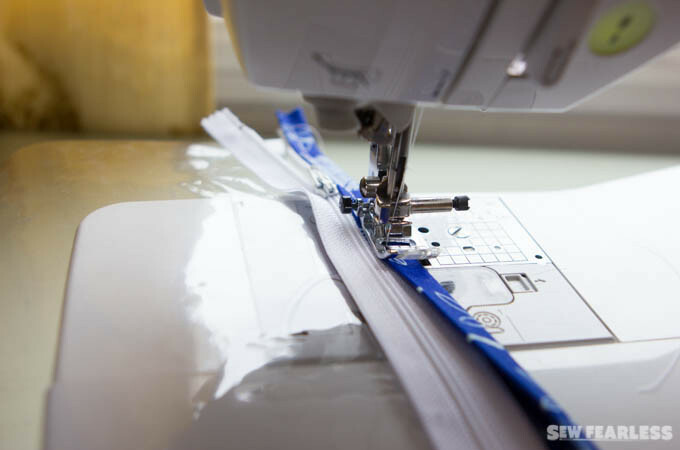 Continue sewing the binding along the right edge, but stop with the needle down before you reach the end. 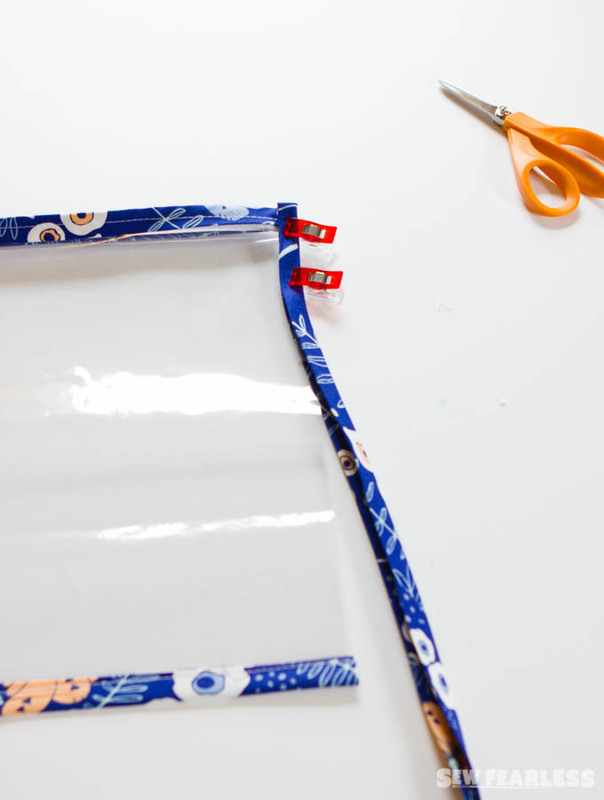 Trim the binding so it is about 1/2 – 3/4 inches past the bottom edge. Then, fold the binding around the bottom edge, like you did the top edge. Continue sewing the bias binding to the bottom edge, backstitch to secure. 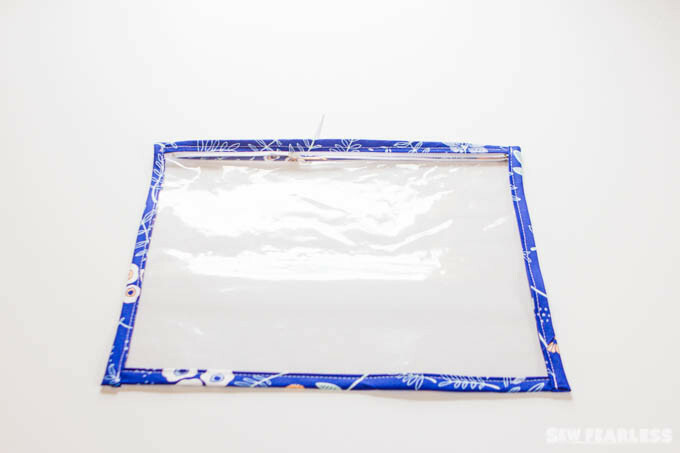 The process is repeated to sew the the left edge of the vinyl pouch. 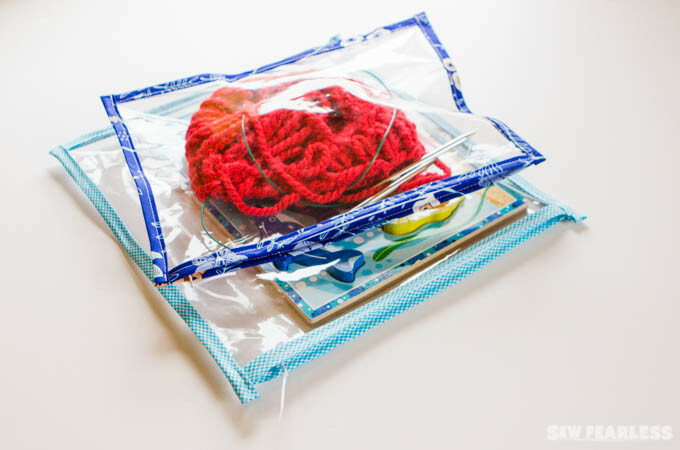 I like this size the best for storing my knitting projects. 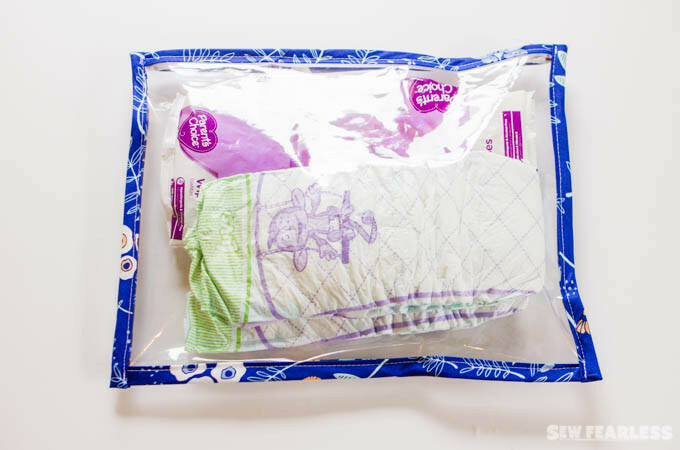 It also happens to be a good size for diapers and wipes. You can change the dimensions of this pouch to suit your needs. 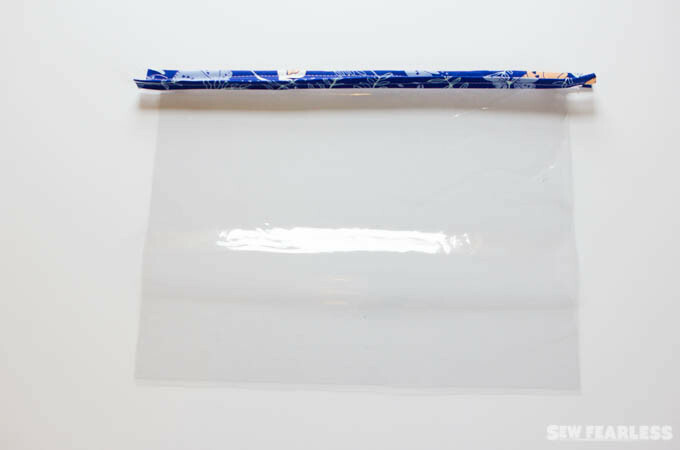 The width of the vinyl is just 1 inch more than the length of the zipper, and the height can be any thing that you choose. 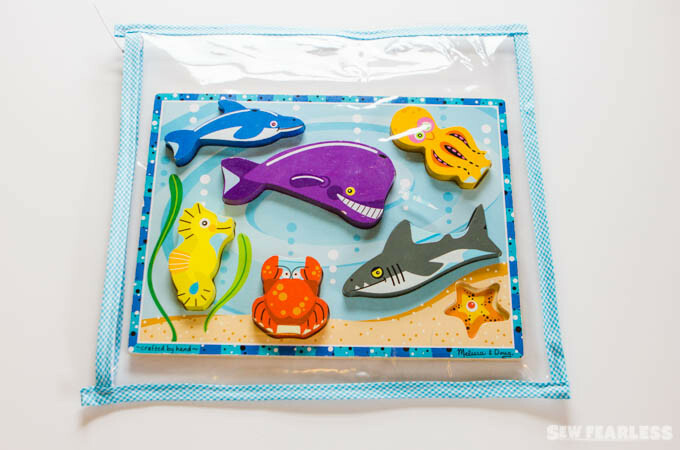 For example, I used a 12 inch zipper, but increased the height of the vinyl pieces from 10 inches to 14 inches, and now I have a nice size pouch for this baby block puzzle! The project is easy and the possibilities are endless. 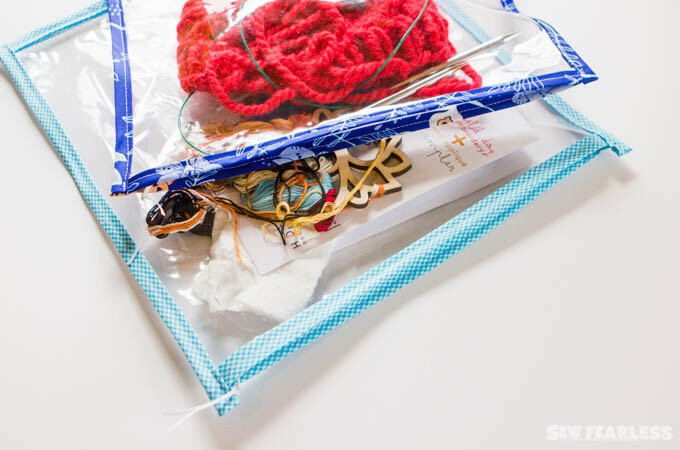 What will you store in your vinyl project pouch? I love sewing with vinyl! See more vinyl projects and tutorials here! These look great! I’ve wanted to do something like this for a while. Thanks for figuring it out for me! I have purchased some of these bags before, love them, but now that I have your directions, I will definitely make my own, and the sizes that are best for me. Thank you ! This project has given me an idea! 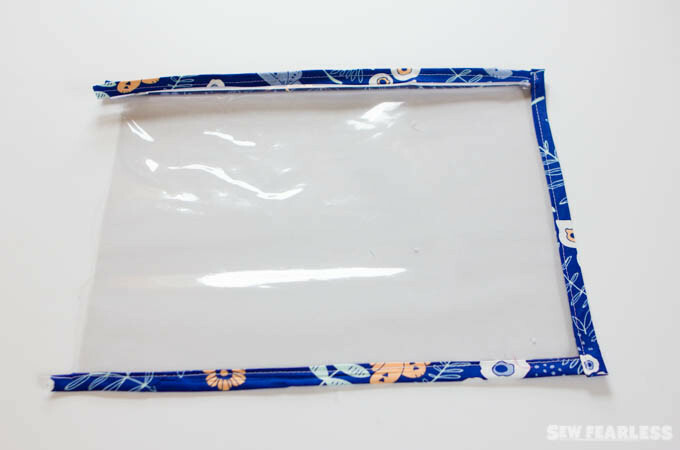 I am going to make vinyl bags that is the size that can hold the pattern stuff, and the notions I will be using. It will have a hole (which will have fabric around it) on the top for placing on the hanger hook. The hanger will have clips to hold the cut fabrics. I will let you know how it goes. WOW, THAT SOUNDS REALLY GREAT !! Let us All know how it works out. Such creativity! Isn’t it wonderful how one persons idea can evolve??? Thank you Jodi for starting this amazing journey! Your original idea is appreciated ! !